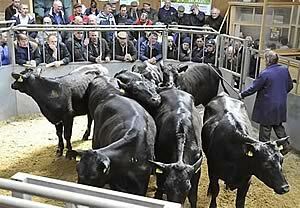 Cumberland & Dumfriesshire Farmers Mart PLC held their Fortnightly Sale of Store Cattle in Dumfries on Monday 24th June 2013. 124 Store Cattle forward – a good quality show was forward and cattle averages were the dearest of the season with Bullocks averaging 226.5p and Heifers averaging 234.8p. Top priced Bullock was £1750 for a British Blue x from WS Davies & Son, Harwood on Teviot, Hawick. Top priced Heifer was £1360 for an Aberdeen Angus x from Messrs CD & PA Wight, Arnmannoch.